The holiday fun at Universal Studios Hollywood will offer more days to be merry this year starting November 17th through January 6th. New this year! Experience Nightly Snowfall along with a charming Christmas makeover of The Wizarding World of Harry Potter™, the return of The Grinch™, Max, and all of Who-ville for Grinchmas™ plus the Merry and Mischievous Minions, it really is a season you won't want to miss! As an annual pass holder, this is one of our favorite times of the year to visit the studio! Many of the “regular” characters have festive holiday costumes on like Shrek and Hello Kitty, the park at night is filled with beautiful lights and Universal Plaza is transformed into a mini Whoville! With so much to see and do we try to visit a couple of times to enjoy it all at our own pace. Hogsmeade™ will be transformed in wondrous spirit with the return of the holiday spectacle of dazzling lights and music cast against the majestic backdrop of Hogwarts™ castle. Enjoy the Holiday Frog Choir as they sing seasonal cheer all with the addition of the smooth bass rumbles of their giant throaty frogs. 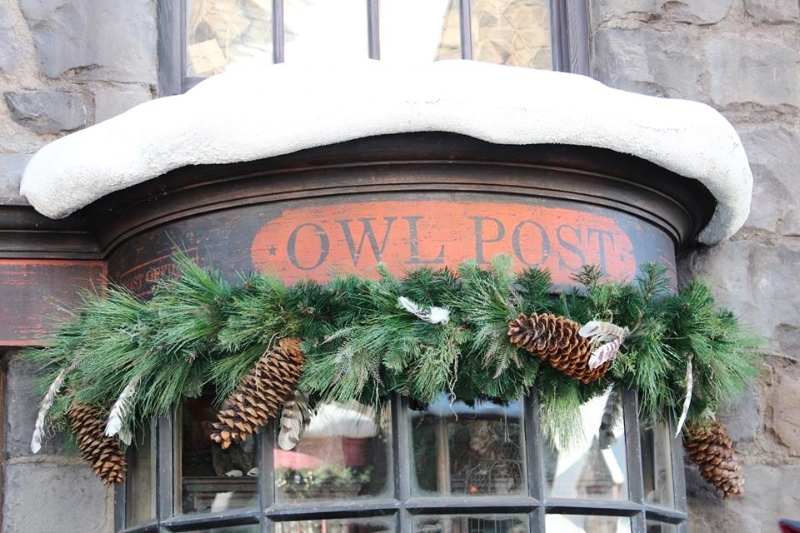 Holiday Décor will be abound as you Stroll through the streets of Hogsmeade™ with festive décor, lights, garlands, and wreaths. No visit would be complete without a visit to Three Broomsticks™, offering up seasonal food and beverage like hot Butterbeer. My go to lunch there is the Fish & Chips or if you are looking to feed a larger group go for the Great Feast Platter that will easily feed 4 or more! Work off your lunch or dinner by visiting The shops! They will have all of your holiday wares with ornaments, stockings, tree toppers and figurines. 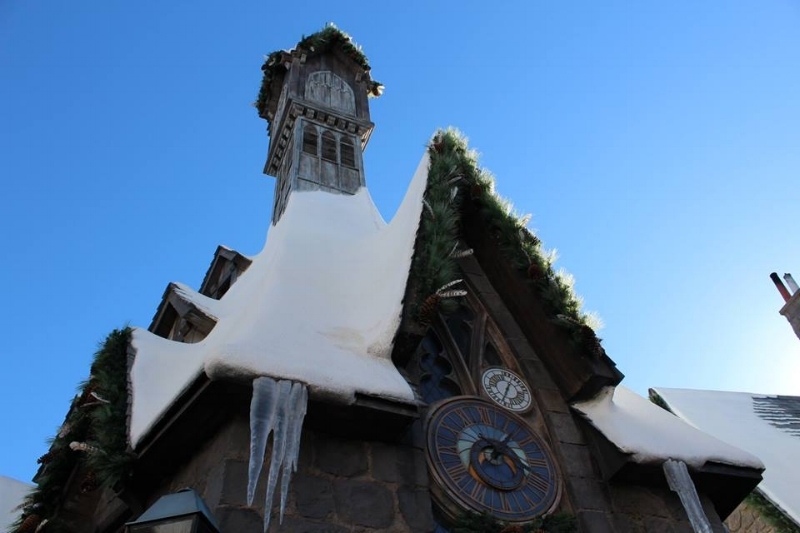 I recommend being within the Wizarding World of Harry Potter by 5pm to see the snowfall and show on the castle. Check the official Universal Studios App or ask a cast member about light show times if you miss the first one. There is also a handicap viewing area if you need, ask in advance and they will direct you to it. The Grinch™ and Max Return this Holiday Season! Spend your holiday with The Grinch™, Max and all of Who-ville, during the most Who-tacular Grinchmas™ celebration ever at Universal Studios Hollywood™. Listen to cheery Christmas carols from the Who-ville singers, share laughs with a Who neighbor, and even snap a Seuss-y selfie with The Grinch™ and Max for festive holiday memories that last a lifetime. This Who-lebration of fun fit for The Grinch, his faithful dog Max and a roster of Who-ville Whos comes to life with a towering 60-foot tall whimsical “Grinchmas” tree where Martha May Who-vier and the WhoDolls will take center stage performing energetic musical sets to usher in the Christmas season in style. The Who-liday Singers a hip boy-band ensemble will perform a cappella concerts featuring a mix of Christmas favorites and pop rock. ﻿Select dates: Dec 1, 2, 8, 9, & December 14 thru 30. Check out what else is in store for you with the Grinch flair! Photo Opportunities: Snap a photo with The Grinch™ and Max for all to see, then enjoy the spectacular lighting of the one-of-a-kind 60 foot Seussian tree. Martha May Who-vier and the Who-dolls: See Martha May Who-vier and the Who-Dolls’ big holiday revue. Send The Grinch a Postcard promising 3 good deeds. Enjoy Grinch themed treats and photo opportunities. Meet tons of WhoVille friends! Foodie guide to 2018 Holidays at Universal Studios Hollywood! And if that wasn't enough, catch your favorite little yellow guys the Merry and Mischievous Minions Snap a festive holiday pic with the Minions before taking a ride on Despicable Me Minion Mayhem. That's a lot of fun and entertainment to squeeze into one visit! Check out the Current offer to visit Universal Studios! Select any available date for your 1st visit. 2nd visit must occur on or before 12/20/18. 2nd visit not valid 11/23/18 & 11/24/18. Purchase is restricted to California residents. Universal Citywalk is even getting into the holiday spirit with a spectacular 40-foot tall Christmas tree glistening with 200,000 LED icicles choreographed to the lights and sounds of the season in the 5 Towers Plaza. Santa Claus will make daily appearances and offer special photo opportunities at 5 Towers. The iconic dancing water fountain situated at the heart of CityWalk will also make a splash this holiday season displaying over 230 individual power jets projecting streams of choreographed water into the air complemented by red and green LED lights and an array of holiday-themed music. Enjoy free concert performances at “5 Towers” and an eclectic ensemble of talented street performers will make CityWalk the ultimate L.A. holiday destination now through select night till December 25, 2018. More info, dates, times and to buy your tickets online visit Universal Studios Hollywood. More fun year round and tips for your next visit!